Social Add World - Payment Proof, View 10 Ads and Earn Money, SCAM? Social Add World has become the most trending platform nowadays which offers some great sources to generate revenue online just by Sharing & watching few Ads daily. It works worldwide. Social Add World comes with the tagline, "Views Ads and Earn Money" online. In this post, I will Review Social Add World in detail and let you know whether Social Add World is a real & genuine program or just another Scam? What is Social Add World? How does Social Add World Work? Is Social Add World Paying, Real or Scam? 1. What is Social Add World? Social Add World is a platform where users and register their accounts, Share & view Ads daily and earn money for watching & Sharing Ads daily. You can use this earning platform on both Mobile & Computers. 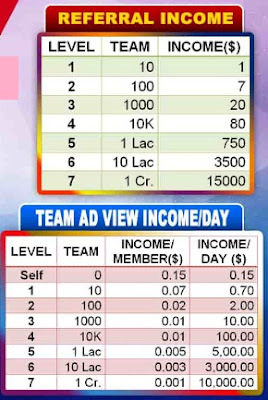 Once can earn daily $0.15 (9 INR) per day by watching Ads. 2. How does Social Add World Work? To participate in Social Add World, you need to register your account at first. CLICK HERE to register your account. 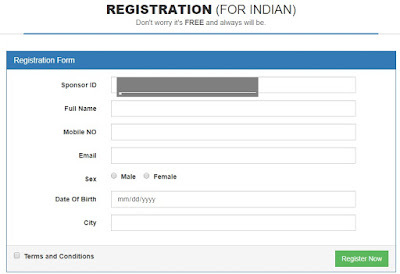 Enter your details and click the "Register Now" button. Your ID & Password will be sent to your entered mobile number. Now, you'll be asked to complete few tasks (just for the 1st time) to make your ID active. Then after, you'll be eligible for viewing Ads daily and earn money. As soon as your ID gets activated, you get $0.50 (30 INR) as a Joining bonus. You need to navigate, "My Ads" section and there you will be asked to ALLOW PO-UPS. After that, you can start viewing & sharing Ads. Once you complete all the Ads (Average 10 Ads daily), the amount of $0.15 will be credited to your Social Add World account. 3. Is Social Add World Paying, Real or Scam? Yes, it's real and paying. Just navigate to the section 5 and check out the recent payment proofs of Social Add World. If you start referring your friends you can earn a huge money with Social Add World. Here you can refer as many people as you can, there is no limit of referring friends. Again here you get two types of referral Income. It offers 7 Level plans. 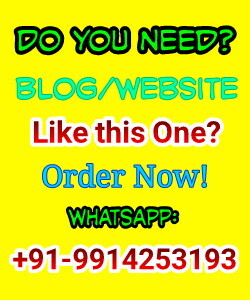 You get $0.07 (4.20 INR) from your 1st Level (direct) referrals. 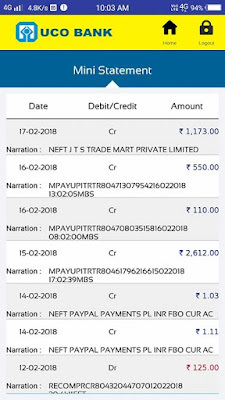 You get $0.02 (1.20 INR) from your 2nd Level referrals. You get $0.01 (0.60 INR) from your 3rd Level referrals. 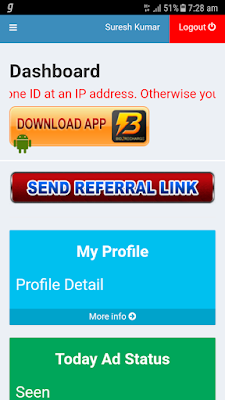 You get $0.01 (0.60 INR) from your 4th Level referrals. You get $0.005 (0.30 INR) from your 5th Level referrals. You get $0.003 (0.18 INR) from your 6th Level referrals. You get $0.001 (0.06 INR) from your 7th Level referrals. If you want to learn 3 Secret methods to get 100+ Referrals for free, then CLICK Here and watch the video tutorial. Social Add World Minimum payout threshold is $10. 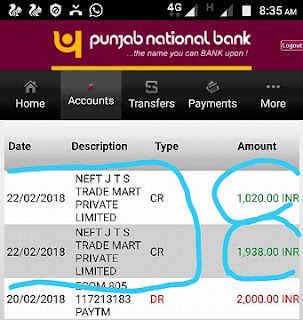 The condition is, you need to take your first withdrawal in their B2R app, onwards, you can get your payout in your Bank accounts (For Indians) and PayPal (For International users). Here are some of the recent Social Media payment Proofs. At last, I can say if you want to make money online then SocialAddWorld could be a better option for you. If you are already enrolled in this program then do let me know your views, experience & thoughts. If you still have any query or questions then you can ask me using the comment box added below the post. I will try to reply your queries within the next 24 hours. Message: I hope that you have enjoyed 'Social Add World - Payment Proof, View 10 Ads and Earn Money, SCAM?' article on Tips2secure. However, if you want me to deliver more items, then please share my post. You can use Social Sharing Widget provided at the end of every post. After all, Sharing is Caring!